Across Colorado, people who have been following Hamilton's progress to see that final check-in on their cell phones and computer screens, celebrated. The check-in signaled the end of a 9-day, 21-hour, and 51-minute record-breaking climb of Colorado's 58 14,000-foot peaks, the Fourteeners. The previous record, set in 2000 by Teddy "Cave Dog" Keizer, had been broken by nearly 24 hours. Most climbers never believed they would see the record fall, but everyone who followed Hamilton's progress via satellite messaging, and through spirited posts on the 14ers.com online discussion forum, was excited to see it happen—including Keizer, who hopped on a plane in Oregon, flew to Colorado, and hiked up the Longs Peak Trail to meet Hamilton at the stopping point, 3,000 feet below the summit. [Per the "Colorado Rule," the Fourteener speed climb dictates that climbers start and end each peak at least 3,000 feet below the summit, with traverses allowed between adjoining peaks.-Ed.] 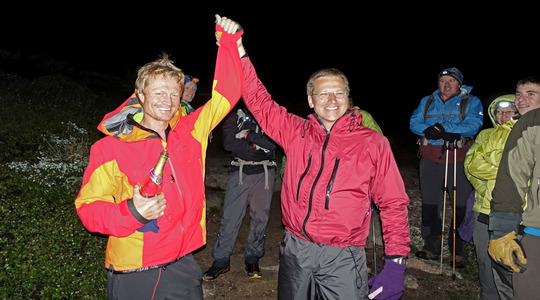 On Thursday, July 9, at 2:21 a.m., Hamilton reached the mandatory elevation below the summit of Longs Peak in Rocky Mountain National Park, where he was greeted by enthusiastic fans, his support team and Keizer. Climbing all of Colorado's 14,000-foot peaks is much more than a simple footrace. The terrain varies from dirt trail, to scree, talus and boulder fields. Some of the connecting ridges between the peaks narrow to barely a boot width. Per the unofficial rules defined by Keizer and accepted by contenders in the race, no "muling" is allowed, so Hamilton could not accept aid of any kind while on foot. He carried his own supplies and was responsible for his own route-finding, all while running and climbing around the clock. 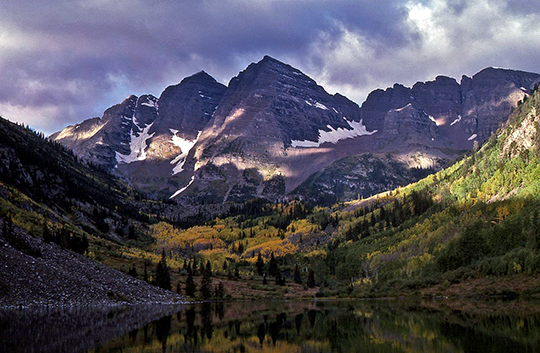 Hamilton's race began on June 29 in the Needle Mountains, a subrange of the San Juan Mountains in southwestern Colorado, with a climb of Windom Peak (14,082'). He stuck closely to a schedule published on his website andrewhamilton.com, completing the remote Chicago Basin group, plus the San Miguel Mountains' Wilson group, near Telluride, on the first day, including the treacherous class 4 traverse from El Diente Peak (14,159') to Mt. Wilson (14,246'). While traverses between summits shorten the overall distance, they are often much more difficult than the standard routes, because of loose and exposed terrain on class 3, 4 and 5 ridges. From the Wilsons, Hamilton moved on to the Sneffels Range above Ouray, climbing the Lavender Col to Mount Sneffels (14,150'), then he traveled to the remote La Garita Mountains for an easy hike to the summit of San Luis Peak (14,014'). Moving east across the San Luis Valley, Hamilton climbed to the highest points of the Sangre de Cristo Range, including the Class 5 Crestone Needle to Crestone Peak (14,197'-14,294') traverse, and a high-altitude enchainment of the Sierra Blanca group, from Little Bear Peak (14,037') to Blanca Peak (14,345'), Ellingwood Pt. (14,042'), and finally Mt. Lindsey (14,042'). After summiting the Front Range's southern- and easternmost Fourteener, isolated Pikes Peak (14,110') near Colorado Springs, Hamilton ran the peaks of the southern Sawatch Range in central Colorado, and scrambled through the Elk Range at Aspen—including a climb of the Class 4 Bell Cord Couloir, in snow, and a crossing of the "Deadly Bells" via the Class 5 Maroon Bells traverse—then finished off the northern Sawatch peaks, including Mt. Elbert (14,443'), Colorado's highest point. Finally, Hamilton topped the remaining 14ers of the Front Range, south to north, with a climb of Longs Peak (14,255') in pouring rain via the Class 3 Keyhole Route, scrambling over wet and icy rock across the exposed ledges of the Narrows and up the steep, slick slabs of the Homestretch, reaching the summit on July 8 at 11:27 p.m.
Thousands logged on to 14ers.com to follow Hamilton's progress; here, his crew shared details on Hamilton's health and state of mind. Some fans flocked to trailheads to cheer him on, while others, including John "Homie" Prater—who, like Hamilton, had made earlier, unsuccessful attempts at breaking the record—joined him for occasional legs on the peaks. According to statistics calculated by forum members, Hamilton hiked, ran, and climbed a total of 265 miles and 139,257' of elevation to gain the summits of the peaks. He was supported by a team that drove him from trailhead to trailhead and provided food, medical care, and room in their vehicles to nap between peaks. Colorado's typical summer weather pattern of afternoon lightning storms on the 14,000-foot peaks will likely keep challengers at bay for a month or longer, but hopeful contenders are already lining up to launch their sieges on Hamilton's speed record in the fall. Correction: July 22, 2015 An earlier version of this article included a miscredited photo. The photo has been replaced and properly credited to Anirudh Sarsam.